Chi-Chu, financial journalist, an MBA candidate in Massachusetts Institute of Technology and a lover of basketball, has spent his entire working life doing journalism. In a career that spanned over a decade, Chi-Chu worked as foreign correspondent for different U.S news organisations. An American of Chinese origin born and bred in Califonia, Chi-Chu’s entire journalism career has been in China. His deep understanding of the political and economic issues in China and the implications of the country’s rising global profile for its citizens and the international community, tells of his many years reporting and analysing the Asian giant. For this member of the pen profession, why the interest in MBA? Chi-Chu’s present pursuit some ways, underscores the transition that journalism as a profession is undergoing generally in this age of internet and the likelihood of a career switch for him in future. Click me to read the story! The key principles that must be followed in any election is that a large portion of the voters participate in the process, and that there is a lack of corruption. The 2012 Presidential Election has become a major turning point in the United States’ election process, in that both principles have disappeared from the radar. Despite the efforts of organizations such as rock the vote, voter apathy has only increased since the last election. When interviewed, many cited a lack of faith in the political system and the amount of corruption. These complaints stem from the second change — the unprecedented emphasis on money. Money has always been a part of the process. Many experts argue that Obama won the 2008 election by spending a record shattering $700 million on his campaign, as opposed to McCain’s $100 million. Despite the campaign funding, here was still a limit on how much an individual could donate to a candidate. However, the birth of a new player — the SuperPAC — is poised to change completely change the election process by giving wealthy individuals and organizations the power to directly market and advertise on behalf (or against) candidiates all the way up until election day. This issue was once again brought to light at a recent talk at MIT’s Media Lab by political activist and director of the Foundation for Ethics at Harvard University, Lawrence Lessig. Lessig has focused the past five years on battling political corruption and focused the discussion on systemic corruption in the current political system. 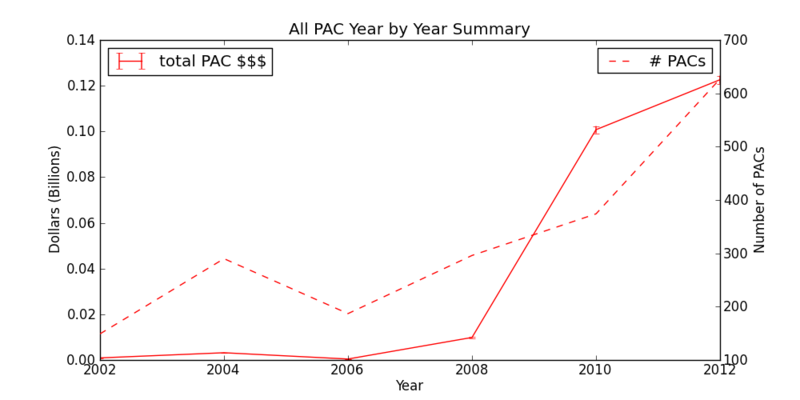 There has been a surge in the number and funding of SuperPACs. The following diagram depicts the number of (dashed line) and total funding of (solid line) SuperPACs over the past ten years. Although SuperPACs (otherwise called Individual Expenditures) have always existed, the number has doubled since the Citizens United ruling, while the total funding has increased 12 fold, from $9 million to $122 million. Not only have the number and total funding of SuperPACs gone up, so has the disparity of the top PACs compared to smaller PACs. The following diagram is a cumulative plot of PAC funds. 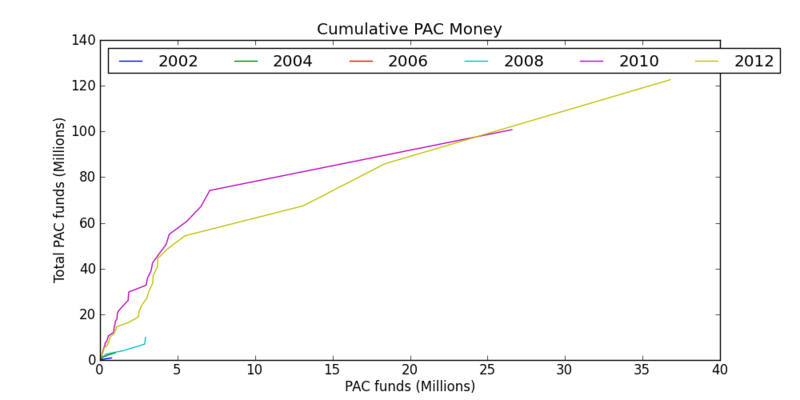 The x-axis show’s the size of a single PAC’s (let’s call it PACMan) funds in the millions, while the y-axis shows the cumulative amount of funds of all PACs the same size or smaller than PACMan. Each differently colored line is the data for a different year. We see a similar story, before 2010, the largest PAC only had $2.5 million. Now, the largest SuperPACs how command over $35 million, far more than some candidates’ entire budgets in the last election. This is money used to not only back candidates that support the SuperPAC’s policies, but to attack candidates that speak contrary to the SuperPac’s opinions. Lawrence made a powerful point during his talk. The mere existance of SuperPACs with so much money and power will force politicans to buy political insurance. Politicans will cater to a SuperPac policies in fear that competitor comes along armed with a different SuperPAC. At what point will these politicans consider the public? All data provided by the Federal Election Committee. All source code available on github.